Have you been looking for the best way to sell digital online? Coupled with the right idea and marketing you can easily start making money right away from the comfort of your home. It all sounds simple, but for some, setting up the required techie stuff is the major road block to launching your own online product. Designing and creating your own checkout page and hooking it up to a payment processor is not a simple task for most. SamCart allows you to launch your next product quickly by providing you with a full featured shopping cart. Extensive integrations and one-click upsells allow you to earn more money for every sale. And hiring someone to code and design a custom solution for yourself will easily run you more than a thousand dollars or so. In today’s review, I’m going to take a look at SamCart. SamCart is the brainchild of Brian Moran, best known for his Get 10,000 Fans business. SamCart aims to be a simple, turnkey solution for marketers to sell their products online and create a professional looking shopping cart. 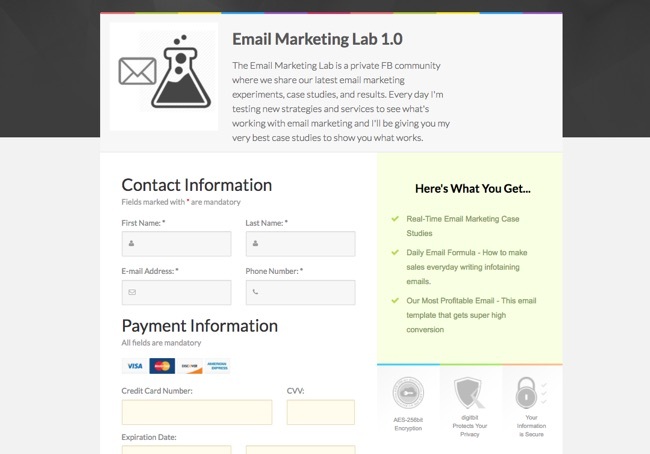 And it integrates with most popular email service providers so you can create high converting sales funnels. Let’s take a quick look at how SamCart can be used to sell your next product online. Do some basic customizations of your template to match your branding and product needs. Add upsells (optional), create coupons, select integrations, create split tests. Promote your product and profit! With SamCart, you can easily be up and running with a fully functional checkout page in under 30 minutes. It is really that easy to use and it’s perfect for marketers who just want to setup a shopping cart that works, with a minimal amount of fuss. When deciding whether or not to adopt SamCart, you will probably first look at the available checkout page templates. The advantage of going with these templates is that they’ve been used by other proven marketers. So you know they work and you can avoid the countless hours of designing, creating and testing your own order page. For example, SamCart recently introduced the Amy Porterfield checkout page template. Amy is a well-known marketer who’s sold thousands of dollars of her own courses and she’s proven in her own business that she can sell. Each of the templates contains specific trust elements like testimonials, guarantees, and security reminders that give your potential customer peace of mind and will boost your conversions. With SamCart, you can now use these very same templates (with your own tweaks of course) to sell your own products. Although I would definitely encourage you to look through the template library to make sure they meet your needs. This is especially important because SamCart offers limited functionality for customizing your page designs. There’s no drag and drop page builder that you might find in LeadPages for example. So there’s no way to add or remove elements from a template. Nor is there any way to move elements around. What can you customize then? Well, you can change the colors of your header, footer, background, headline, and buttons. You can individually pick your colors or choose one of the pre-made preset color combinations. You can also choose what form fields to include on your page including shipping, billing, phone number, and coupons. And finally, you can add custom bullet points to describe your product features and include testimonials from your customers. Pages are mobile responsive so they’ll look good on smaller devices. Templates support multiple languages so you can sell in languages other than English. All your shopping carts are SSL encrypted so your customer will have peace of mind that their payment info is safe. If you want the full power of customizing your pages to look exactly how you want, then SamCart might not be the right fit for you. But for others who just want to get up and running with a low learning curve, then SamCart can and does work extremely well. To start selling products, you need to a way to collect payments from your customers. And for that, you need to have a payment processor. SamCart supports the 2 major ones people use which are Paypal and Stripe. Stripe is great, as it provides you with a no hassle way of taking credit card payments. Integrating with Stripe is easy. I just had to go to Settings > Integrations and click the Add New button. Since I already had an existing account I just had to log in to Stripe and click the Connect to my Stripe account button. After a few moments, everything was hooked up. SamCart has a useful sandbox mode. This allows you to ensure everything is working properly before going live with your product. This means you can test payments without actually charging your credit card and without messing up your stats. Similarly, you will want to integrate SamCart with your favorite email service provider. SamCart supports a wide variety of email service providers including ActiveCampaign, ConvertKit, and Drip. This will enable you to tag or add your new customers automatically to a specific buyers list on your autoresponder account. Or conversely, if a user refunds a purchase, you can take an action like removing them from the list. SamCart also has Zapier integration which is awesome. This allows you to integrate SamCart with Zapier’s more than 700 different apps. It’s pretty simple to setup, and there’s a helpful video that in the knowledge base to get you started. Here are some possible integrations I’ve come up with, but of course there are plenty more I’m sure you can come up with. Send text messages to your phone on new orders and refunds using the SMS app. Create a real-time spreadsheet of your customer orders using the Google Sheets app. Send a refund notification to your Slack channel so a team member can reach out and find out why they canceled using the Slack app. Ship a physical product on every new order using the ShipStation app. How would you like to bring in extra revenue with every sale? While your main business probably revolves around selling a main product or service, you can easily boost your sales by incorporating order bumps and one click upsells to your sales funnels. An order bump is basically an add-on option, presented on your shopping cart page that requires a customer to check it to add it to their order. An upsell is similar, although it gets presented after the customer has purchased your initial product. SamCart makes adding both of these options easy, although Upsells are only available to Pro plan members. Order bumps can be added directly from your Products page. All you need to do is select another one of your products from the drop down, add a description and you’re all set. SamCart has a dedicated upsells page that lists your upsells and allows you to add them. Just give your upsell a name, a description and attach it to an existing product. Then you’ll need to create a Funnel which allows you to add between 1 to 5 different upsells (and downsells). Each of these upsells will be shown after a customer order. Once this is done, you will be able to pick a particular funnel whenever you’re creating or editing any of your products. By putting some thought into your upsell strategy, you can really achieve some impressive sales with your promotions. For example, Amy Porterfield used upsells for her Webinars That Convert promotion and it resulted in an extra $170k in revenue! 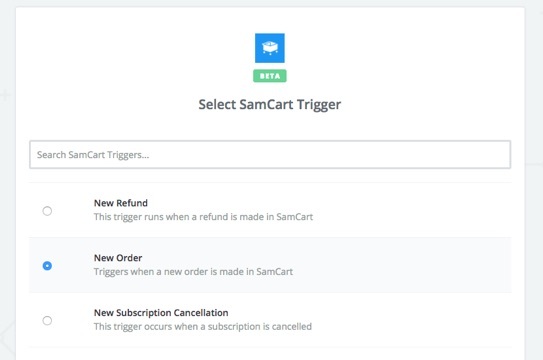 Finally, SamCart allows you to create coupons for your products. Coupons are a great way to boost your sales because everyone likes to save money. With SamCart you can create both Percentage off and Flat rate coupons. And you can attach them to all your products at once or just specific ones. SamCart has 3 different plans, Basic, Pro, and Premium. Basic is $19 a month, Pro is $99 a month and Premium is $199 a month. The Basic plan gives you access to most of the templates and all the email integrations. But SamCart charges a 1% processing fee on all orders and you don’t get upsells, reporting, split testing and some of the other advanced features. The Pro account gives you everything except the Subscription Saver and Affiliate Center features and doesn’t charge a processing fee. To get those, you need to pay an additional $100 a month for the Premium plan. So what are these 2 extra premium features? The first is called the Subscription Saver, and it’s for people who sell subscriptions to their product or service. One of the problems with subscription plans is you will inevitably fail to bill your customer’s credit card sometime in the future. It could be because they canceled their card, it passed its expiration date or any other number of reasons. Normally, that means you have lost that customer’s recurring income forever. But with subscription saver, SamCart will automatically send an email to your customer on your behalf and give them a link to update their payment information on file. Once the customer does this, SamCart makes the late payment and keeps the subscription going. The other premium feature is the SamCart affiliate center. This will allow you to start recruiting an army of affiliates to help you promote your product and bring in more sales. I haven’t really had a chance to implement this myself yet, but I’ve watched all the tutorial videos to see how it works. SamCart provides you with both an affiliate login and signup url for you to send to prospective affiliates. Inside the affiliate center, you can see a list of all your affiliates and their stats (clicks, orders, commissions, earnings per click). This is also where you can approve affiliates to your program. You can set up the commission structure for each of your products (% or flat rate) and set your cookie expiration days. Plus you can create your affiliate links and email swipe copy for your affiliates to use. Once signed up, affiliates get access to their own personlized dashboard. Here, they can see their stats, view reports and get their personalized affiliate links. The affiliate center will also help you manage paying your affiliates. You can see both the pending commissions of all affiliates and the payable commisions. Clicking the Pay Now button will generate a CSV file which you can then upload into Paypal to do a Mass Payments to pay all your affiliates at once. The most obvious competitor to SamCart is ClickFunnels, so I wanted to do a little comparison between the two. SamCart is all about creating your sales funnel fast. It’s laser focused with its shopping cart templates, upsells, payment and email integrations. ClickFunnels on the other hand is an entire marketing funnel platform. Sure, you can use it to solely create checkout pages if you want. But with ClickFunnels, you can do things like build landing pages, create membership sites and sales funnels. With Actionetics it can also replace your email service provider and Backpack gives you its own affiliate system. ClickFunnels also has a more powerful drag and drop template editor that allows you to have total flexibility in designing every one of your funnel pages. Does that mean ClickFunnels is the clear winner over SamCart? With all this extra functionality, ClickFunnels also has a much larger learning curve. Sometimes you just want to launch fast with not a lot of fiddling around. This is where SamCart excels. Perhaps you are already using Thrive Content Builder for your landing pages, and you already have ActiveCampaign as your email service provider. SamCart then just becomes one piece of your workflow that you can just plug in and start making sales fast. ClickFunnels also has some annoying limitations. The cheapest plan limits you to the number of funnels and pages you can create. Plus, you also have an overall visitor limit to your funnels. SamCart doesn’t have any of these limits. You can host unlimited products and have unlimited visitors. What about SamCart vs a service like Shopify? Shopify is probably the most popular e-commerce platform for selling products online. However, they both fulfill different niches. You would use Shopify if you wanted to create a full featured online store. Especially if you want to sell a number of physical products. SamCart is more for marketers who want a quick and simple way to sell things like ebooks, memberships, services or software products. And get extra value by incorporating features like upsells, click bumps and split testing. These are features that are not a core part of Shopify and only available as paid add-ons. It’s also much easier to setup a SamCart checkout page, then designing a fully polished and working Shopify store. Overall, I found SamCart to be a smart way to start selling any digital product or service fast. It’s very easy to get up and running very quickly. And it’s very simple to boost your value per customer by easily adding upsells to your products. The cons, of course, is that you don’t have the total control you might get with other page builders like ClickFunnels. Depending on your requirements, I feel this tradeoff can be worth it. Just make sure you take a look at the provided templates to see if they will work for you. So if you are a digital marketer and are looking to launch a new product, I would highly recommend giving SamCart a look. It’s one of the easiest ways to set up an online shopping cart and I think it will prove very profitable for your business. Which Landing Page Software Is Best For You?